Now that everyone has seen the finished covers for my new books, I thought it might be interesting to share some insights on how I came to these design decisions. Being able to create a cover from scratch, precisely as I want it to be, was a delight and very fun. It was also hard work! First I had to think of what aesthetic I wanted. My vision was to keep with the general look of my previous novels, those done by Sourcebooks. Meaning, a scenic image on the bottom, a scrolling title banner more or less in the middle, and the lovers above. The trick was to have a similarity while being unique. Right! I could have used the same portrait images for “Darcy” and “Lizzy” (and I may do that with future Saga novels) but for books going backwards in time, so to speak, I thought a new couple would be better. Most importantly (to me) was having a man and woman who were interacting in some way, rather than just side-by-side and unattached. I envisioned them looking at each other, maybe holding hands or him kissing her hand. 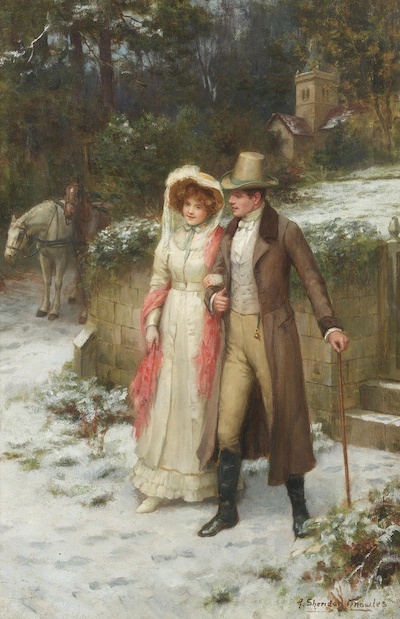 Something romantic but “clean” and chaste, as befitting a Regency courtship. For a while I was torn between finding a painting or using live models. I scoured the stock photo sites, free and paid, for couples in a romantic but not too intimate pose. Long story short, it was a nearly fruitless endeavor! Finding a pic for romance novels with the man fully clothed is next to impossible. LOL! I found a few options that might have worked in a pinch, but none that thrilled me. In between the hours here and there searching through stock images, I also perused dozens of websites featuring paintings from the past. And of course there is Pinterest! A real treasure trove of any kind of image one can imagine. I honestly have no idea how many images I looked through. Easily a thousand, and that is not an exaggeration. There were a number discovered that I could have made work, and I have saved those for future possibilities. None really hit me as “right” until suddenly, just as I was about to give up and make do, I stumbled across “Safe at Last” by George Sheridan Knowles. The painting date is unknown but well over one hundred years ago, so in the public domain. Excellent! This is how the painting is in its original version. As you can see, it is a winter scene. Step one was to alter the coloring from snow to grass. I did this with GIMP, which is a software program similar to Photoshop but for Mac computers. I have used GIMP for years. Doing this type of manipulation isn’t difficult, just time-consuming. Between GIMP and iPhoto, I did some general sharpening and darkening of the image as well. The only other change made to the original Knowles painting image was to darken the woman’s hair and to ever so slightly alter her face. I felt she looked too young and soft. Luckily, my husband, who is a photographer, has a program that specifically manipulates facial features. It is meant for real people in photographs, but worked well enough to give this “Elizabeth” a distinctive appearance. At this point, let me note that there is never a painting that is going to perfectly embody the vision I have in my head. Over all I am very, very happy with the people chosen for my previous covers, but none of them are exactly right. Trying to find a painting with two people complicates matters. The woman may be good but not the man, or vice versa. Or maybe the faces are good but they are in clothing not of the Regency. And on it goes. In the case of “Safe at Last” I really liked the man. No, he isn’t Matthew Macfadyen, but he is handsome and manly. I would have liked him to be a bit taller, or the woman shorter, to fit my Lizzy and Darcy, but no way to alter the image for that. At least, I am not talented enough! Safe at Last after photo changes. Point is, I fell in love with the painting so much that instead of cropping it in half with a landscape on the bottom, I used all of it. The title background, and lace and ribbon on the bottom, are from my digital scrapbooking files. Came in very handy! The main title and “Darcy Saga Prequel” text came from Cool Text, a free online site for logo and graphic creation that I have used loads over the years. I created a couple dozen versions with different colors and scripts. Each one was trialed with opinions gleaned from my family, until deciding on this script with the pinkish shadowing. The final text is called “chopin” except for the ampersand which is “champagne” because I felt it fit better than the chopin &. Lastly, my name is the same font (or close to) as on my other novels, only color-matched to the title background. How long did the creation take me? Most of two days, I think. And that does not count the searching! As for the back cover, I used the landscape I had stumbled across during my searches to originally be on the front cover. Like with the people paintings, I found several possibilities. What was I looking for? 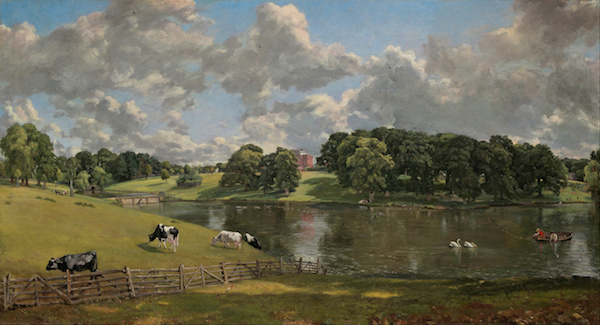 Can you figure it out by viewing the painting by John Constable? Note the house in the background, the stream/river cutting through the grassy pastureland/moor, and the small bridge? 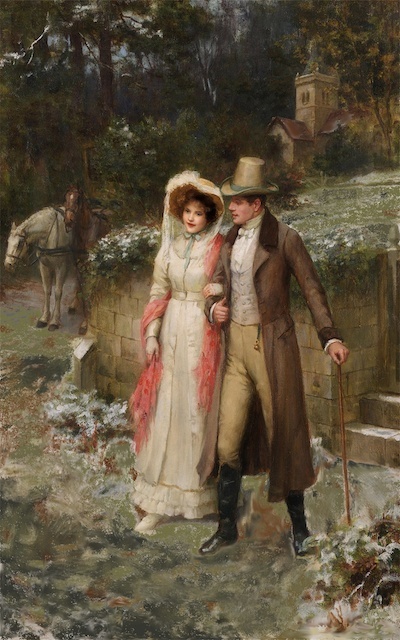 If you have read my first novel – Mr. and Mrs. Fitzwilliam Darcy – you might recall that William buys a painting for Elizabeth that reminds him of the area near Longbourn where he proposed. Ah! Yes! This painting by the famous Constable (also in the public domain), especially when cropped to remove the boat, is pretty darned close to my mental image. Not precise, sure, but a fine representative. What do you think? As a final note, I mentioned a couple of times about images being in the “public domain.” This is where copyright laws come into play. Finding an awesome image is only half the battle. Ensuring that the image is useable for “commercial” purposes is essential. Permission, if not specifically a “free” stock image or in the public domain, is a must. In some cases paying for an image is an option – prices are all over the place and quite high for full copyright – and then you have to read all the fine print to make sure HOW you can use the image. For instance, a couple of the live model sites allow buying images for a decent price for book covers, but the print usage is limited and/or the ability to put the designed cover on a non-book product like a mug or poster. In other cases a person can gain permission from the image creator, such as I did for the map in The Passions of Dr. Darcy. Some are generous, as Mr. Smitha was on the map, but others may not be. For me, since I wanted original paintings anyway, using one that is in the public domain with a totally free copyright was preferred. Still, by law, I must attribute the painting accordingly, which I am doing on my copyright page in the novels, and in this post. There you have it! I hope this was interesting. Any other questions, feel free to ask! Tomorrow I’ll continue this topic with how I designed the cover for Hope of the Future. I found this interesting and insightful.. Thank you for sharing. I see the book was released on Amazon today. Any idea when it will be available for NOOOK. I did check the B&N sight and it wasn’t there. I know B&N sometimes hass a bit of lag on their releases. I can’t wait to read this book and the next. Sorry, didn’t finish before I hit comment…..I love the cover and agree the couple look to be in love. Except for height they look like they could be Elizabeth & Darcy. I love the back cover. it is close to the way I pictured your description of the painting Darcy gave Lizzy. Beautiful choices. I was able to purchase it for my NOOK today. Yeah! The cover is very pretty and well done! Thanks for sharing your process. It is always interesting to read how someone manipulates and changes pictures to get the desired results for their covers. I wish you much success with your new books. The finished cover is beautiful and gorgeous. Thanks for sharing the long and arduous process with us, your faithful readers. We appreciate your efforts not just in writing but in designing the covers as well. Looking forward to read your new books. All so interesting Sharon! thanks for sharing the process 🙂 I love the original painting and you have adjusted it beautifully to fit the image of your characters. I like your choice of darkening the hair in particular. And also I didn’t notice that you changed the snow to grass, amazing! The back cover scene is lovely too. All very lovely and I look forward to hearing about the newest cover too! You are exactly right, Vee, in that the covers have to “evoke” a feel for the characters and/or contents. Never can any publisher get it precisely right as the author imagines.